While the Cokesbury display at Annual Conference has been a fixture for years, much has changed behind the scenes during the past year in an effort to provide more services to annual conferences. 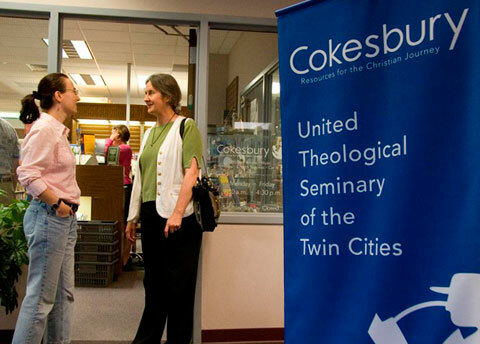 The United Methodist Publishing House, which oversees operations at Cokesbury, announced in November that it was shuttering all 57 of its brick and mortar stores, including those at United Methodist seminaries and moving to employing 50 community-based resource consultants (CRCs). One of the closed stores was located in St. Louis, Mo., the store which stocked and staffed the store for the Illinois Great Rivers Annual Conference. The final store closed April 27. Cokesbury is still in the process of assigning a resource consultant for the Illinois Great Rivers Conference. In the meantime, Brian Maddy, who serves as inventory and distribution manager for the Publishing House and Cokesbury, in Nashville, Tenn., will be overseeing a staff of four persons at this year’s annual conference. In anticipation of the 2013 Annual Conference, a book list of suggested resources specific for Illinois Great Rivers Conference, has been assembled and can be found at: www.igrc.org/AC2013BookList. In a recent interview with the United Methodist Reporter, Neil Alexander, president and publisher of the United Methodist Publishing House, said the time was right to move from stores to online sales, mirroring the trend of shoppers. “We’ve worked hard to make the stores as welcoming and effective as possible to serve thousands of people in scores of local areas for decades, and the fact that they will be missed by many is entirely expected,” he said. Though some stores operate in the black, and overall sales for UMPH rose last year, the stores’ staffing and other expenses as a group now outpace their sales by $2 million, Mr. Alexander said. UMPH is also required to stay afloat without general church apportionment funds so a decision was made to focus on online and call-center sales while putting more sales representatives in the field with the use of CRC’s. As part of their duties, CRC’s will visit churches and meet with leaders in the annual conference to discuss their resources needs. They will also set up displays at special events in the conference. Alexander noted that the consultants will be working with a cadre of colleagues in Nashville to match resources with particular ministry needs and to answer questions about products ranging from robes, curriculum and to small group studies through stewardship resources and Bibles. And Alexander said improvements to Cokesbury’s website are planned to make for a better customer experience. “Cokesbury is alive, well, and expanding the ways it will serve churches and their leaders,” Alexander noted.